A luxury cloth book made from beautiful soft, fleece, featuring a day in the life of everyone's favourite cuddly bunny, Peter Rabbit. Perfect gift for any newborn babies. Hop, skip and jump with Peter Rabbit. 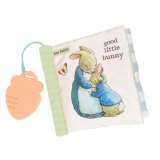 Enjoy this soft and snuggly cloth book, perfect for young babies. With wonderful pictures of Beatrix Potter's best-loved creations, including Peter Rabbit, for children to finish and colour.This delightful doodle book will provide hours of fun for little artists, encouraging creativity and stirring the imagination. This shaped board book in a large trim size is the perfect way to introduce young children to the wonderful world of Beatrix Potter. Complete with original illustrations and simplified text from each tale, children will delight in sharing the adventures of Peter Rabbit.